VCE is the most important year in any Victorian student’s education journey. Our course is especially designed to help you achieve the results you want on your VCE exams – it’s all up to you to put in the effort. scheduled cumulative tests every 5 weeks to help you revise content from the beginning of the year up until that point to gradually build up your exam technique and confidence to give you every opportunity to achieve success in your final exams. We’ve found that many VCE students do not know how to study. Further, many do not know how to manage their time during this crucial year. This is why we have built in proven study strategies pooled together from all our past and present tutors, many of whom have achieved perfect study scores and ATARs of 99+. We have incorporated these strategies within our classes to help you work consistently throughout the year. Our courses have been specially designed to focus only on the most important aspects, which based on our detailed analysis of past years’ examiners’ reports are most likely to come up on the exams – so you don’t have to. VCE is a demanding experience for most students. Students can suffer from anxiety due to the workload and the stress of the competition can cause some tremendous emotional pressure. By the middle of the year, most VCE students lose motivation to study and lose the will to try. By the end of the year, the stress of the approaching VCE exams and the insecurity that students face can cause VCE burn out. In a recent blog post, we talked about how VCE success is doing one small thing each day, to prevent students from becoming overwhelmed towards the end of the year. If students don’t break down their VCE study in manageable chunks, they will find that by the end of the year, they have to cram an entire year’s worth of content for up to six subjects in a few short weeks. If you haven’t read it, please click here. We strongly suggest that you do so. Most students have heard about the importance of breaking tasks into manageable chunks so they aren’t so overwhelmed by the end of the year. To ensure that students are continually revising throughout the year and not just leaving exam study until the end of the year, we conduct weekly quizzes with results posted online to our management system. In addition to this, we offer real exam preparation through our cumulative tests held twice per term. These tests will cover all content taught up to that point to ensure that earlier material isn’t forgotten as the year goes on, and to ensure students don’t have to relearn material just weeks before their final exams at the end of the year. 2. We make it easier for you to learn from the mistakes of others. Our course books contain a section titled ‘Insights from the examiners’ report’ which outlines problems that past students encountered for specific learning areas. Students are then able to apply this knowledge to a series of relevant exam style questions. 3. Our classes are designed to focus on developing the knowledge and skills to succeed at your VCE exams. We systematically work through topics to help students gain a full understanding. We go through worked examples in class, allow students to have a go at similar questions then provide opportunities to practise their skills further through a range of questions. After this learning cycle, students will then be given a chance to apply this knowledge to exam style questions. 4. 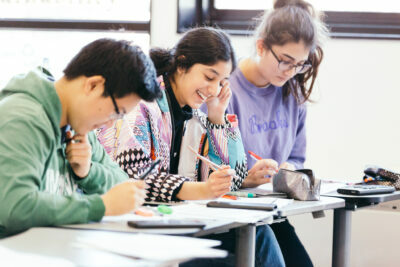 You will be taught and mentored by a top performing VCE student equipped with the latest teaching techniques. Our tutors are top performing students who have come out on top despite the challenges that the VCE can bring. They understand exactly how you are feeling as you prepare for some of the most important exams you will ever encounter and can guide you on how to perform to the best of your ability.